Because of the prevalence of road accidents in this economic climate, many people are forced into considering making a traffic accident injury claim in the UK to ensure that they are financially secure when they are unable to work. 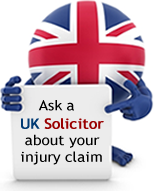 This Web site is dedicated to compensation claims in the UK. Irish readers should refer to this site. The Department for Transport´s latest “Road Casualty Statistics” (June 2011) lists 208,648 reported casualties — from slight injuries to fatalities — resulting from all traffic accidents in the UK. As such, many people are adversely affected by traffic accidents year after year. While it is not always the case that there is someone else at fault for the resulting accident, negligence is often the culprit, justifiably giving rise to compensation claims for injuries sustained. Without question, the first thing to do after a traffic accident is tend to health needs — both yours and your passengers’. If an ambulance and the police do not come to the scene of the accident, you will want to report to the casualty department of the nearest hospital. Or, if you really don’t feel the accident was serious enough, make an urgent appointment to see you general practitioner. Remember that nothing can compensate for your loss of health, and you want to ensure that you do not aggravate your injury by failing to seek immediate care. Your attendance at hospital will also be duly noted, and will later support your UK traffic accident injury claim should you decide to make one. If your accident occurred while you were a passenger on a bus, taxi, train, or other means of transport, you are eligible to seek compensation — provided that a negligent party is responsible for your injuries. As with other types of claims, you will want to make sure to tend to your immediate health needs first before considering an accident claim. If the police are not present after the accident, you still need to report the incident to them at your earliest possible convenience. At this time, you will also want to provide the names, insurance details, and registration numbers of the parties involved if you have been able to collect this information, and any additional details, such as the time and location of the accident. When you are not seriously injured (or have not been rushed to hospital), you are required to remain at the scene of the accident long enough to answer relevant questions by the authorities, exchange insurance and contact information with the parties involved, as well as note the registration numbers of the vehicles in question. At this time, it is also essential that you do not admit liability for any part of the accident. In fact, discussing liability at this time is inadvisable. There may be cases, however, when these formalities are impracticable, either because of confusion, anger, or other extenuating circumstances. When exchanging information with the other party is not possible, you should at least make a point to note the vehicle registration numbers, as all the other details can usually be obtained from it. If you were the victim of a ‘hit and run’ accident, however, different rules apply. While this would be very distressing indeed, be assured that you can still seek compensation through the Motor Insurers’ Bureau, which exists to ensure protection for those injured by uninsured or unidentified drivers. Your cell phone can be used to call an ambulance and the police following a traffic accident, as well as to record images of the scene of the accident. If possible, aim to take photos of the result of the collision, noting the license plate numbers of the affected vehicles. In addition, you may want to record the positioning of the cars, as well as the the road and weather conditions at the time. These images can later prove very useful in supporting your UK traffic injury claim. It is not uncommon for people to be contacted by the party at fault’s insurance company following a traffic accident. While you may interpret this as a genuine offer to accept responsibility for the accident and make amends, often times these early offers are inappropriate — the compensation amount offered is typically much lower than you would otherwise receive for the traffic accident. Rather than settling directly with the insurance company, it’s best to wait until your interests are adequately represented. For this to happen, you are strongly advised to seek the assistance of a solicitor. Beware of so called accident 'management' companies (sometimes known as claims handlers or assessors). These handlers are not legal experts, and often work on a commission basis selling your claim to a solicitor. 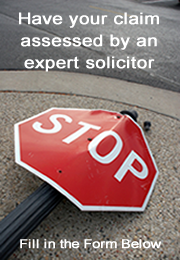 While there are honest claims handlers, it’s advisable to seek counsel directly from an experienced solicitor. In cases where the solicitor’s success fee is considered excessively high by the courts, the losing party will only have to pay up to an amount that is considered reasonable. Therefore, you should ask about this. Following an injury, you may be offered all kinds of advice. The best advice, however, is usually impartial and professional. Our free legal advice service is here to assist you with all your questions and concerns about making a traffic accident injury claim in the UK. It puts no pressure on you to make a claim; rather, it aims to inform you of the best options for your individual circumstances. And should you wish to proceed with a claim, one of our solicitors will concentrate on getting you the maximum compensation for your injury, so that you can focus on more important matters — your health and wellbeing.